One of my hubby’s friend owns a farm. He often comes to supply the surplus produce to the greengrocer that I usually go to if I don’t go to the market. He gives me either vegetables or papayas whenever I go there. Last week he insisted that I take 3 huge papayas. They all ripened at the same time. Now there is so much papaya one can eat. So the next option was smoothie or a jam. Smoothie didn’t sound too exciting, especially when the tummy is full. I am glad I made the jam. Its so easy to make it. I should stop buying the local jam as there is no fruit in it, its too sweet, full of colour and citric acid taste. I used less sugar, but it tastes just right. You may wonder why I have added cumin powder. Papaya for our family means papaya, a pinch of salt on top and a liberal helping of the cumin powder… yum! I have used a recycled jar. I usually keep all the glass jars. So I have a variety of them, coffee jars, olive jars, etc. I just dip the clean jar in hot water. And the labels and glue come off so easily. In a city that still does not have the law of separating rubbish and recycling, we have to do our bit. Newspapers are bought by vendors to wrap vegetables, fruits, street food etc. Plastic cans are picked by street kids and beggars to be sold to the plastic industry. Old clothes, shoes, handbags, books and toys are given to the needy if still in good condition. In a way I am glad that we can recycle some of our unwanted goods in this manner. Its disturbing to see mattresses, chairs, sofas, furniture etc put out on the streets in the western world to be disposed off. Hubby and I always comment that back home someone or the other would have been more than happy to own it. Enjoy making the jam. Its easy and simple and delicious. Put papaya chunks, water and sugar in a pan over medium heat. Mix till the sugar melts. Mash the papaya once it becomes a little soft. I didn’t mash it to a smooth puree. I left it a bit coarse. Add the lemon zest and let the mixture simmer over low heat till it becomes thick. Make sure you stir the mixture as you don’t want it to stick to the pan or get burnt. The mixture will become thick in about 30 minutes. Add lemon juice and cook it for a further 3-4 minutes. Add cumin powder and stir well. Put the jam in a clean sterilized jar. Sterile the bottle in hot water or a hot oven. Remove the fibre and seeds well from the papaya. You can add cinnamon or cardamom powder instead of cumin powder. I used only ½ cup of sugar as I don’t like overly sweet jams. I store the jam in the fridge as I don’t want it to get spoilt in the hot weather and since I have not used any preservatives. Papaya Jam sounds good, here in Calgary, I hardly see papaya in shops. I remember in Kenya, I had four trees of papaya in my kitchen garden. Sadhna, it is a good simple jam. I know papaya is a luxury fruit in the western world, the way blueberries, other berries and cherries are for us in this part of the world. Nice combo .. jam must be sweet and tangy..
Not too sweet Shobha as I have used less sugar and yes tangy. Adding lemon zest gives it a bite. 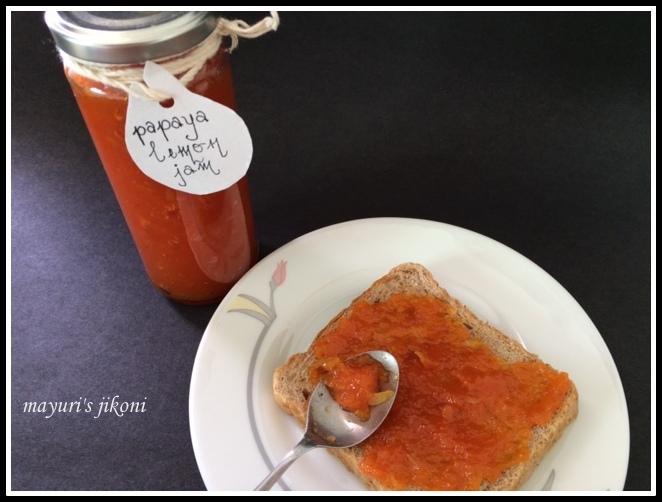 I have never tried papaya jam, it sounds delicious.